Hello everyone! Today I'm happy to share a Layers of Color gift set I made! I used the Victorian Frame Cling art stamp to create my frame for my card and a matching handle for my little purse gift card/ gift holder. The image itself is colored with Copics and cut out right along the outside of the stamped line. I have matted it on the card with Soft Suede card stock cut with Spellbinder's Label Fourteen, which the stamp was custom designed for. 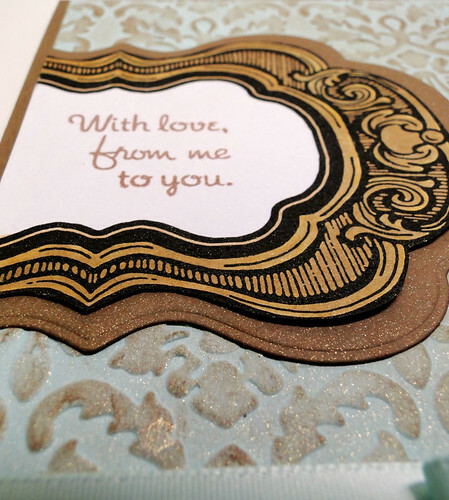 My basic card stock is Papertrey Aqua Mist, run through the Cuttlebug with the Cassie's Brocade folder, then sponged with TH Distress Ink. To make the purse I cut and colored two of the Victorian Frames and cut them out, folded them in half with finished sides out and adhered together. This way both the front and back of each handle is finished off. I cut two Spellbinders Label twelve, ran through the Bug with Cassies Brocade and embossed the same as the card. I cut a strip of aqua card stock 1.5" wide by 7 3/8" long, scoring along the long edge at 1/2" and 1". Across the short side I scored at 2 1/4" in from each end, snipped in to the long score line and folded. I adhered the folded edges to the front and back of my labels twelve with tacky tape. I cut a Spellbinders Label Label Ten and cut 1.5" off from the longest point on both ends, embossed and sponged. I adhered my handles to the outside of my purse with just enough overlap to hold, then adhered the 1.5" cuts of the label ten to serve as a flap on the purse front and back, and that covers the edges of the handles. I added a Prima embellishment and Papertrey Aqua Mist ribbon. The card is very straight forward, using the same materials listed above. The sentiment is from a Verve set "Feeling Groovy". I cut off the frame with a straight edge just for interest. I spritzed everything with Glimmer Mist in gold when finished. I hope you enjoyed this little project and that you might try one yourself! It was a lot of fun coming up with my own design that I thought was a unique way to use the victorian frame. If you make one please link me and let me know so I can come see yours!!! Thanks for stopping and leaving a comment! I love knowing you were here! Magnificent project, Grace! Your creativity shines! Oh My Word Grace, this is fabulous. 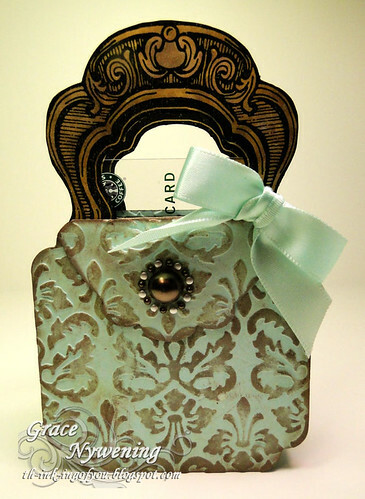 Love how you came up with this creative idea for the purse and card. Aw!! So sweet and gorgeous my friend!! I just love your creative purse!! I hope you have a great day...stay safe!! These are absolutely breathtaking, Grace! Stunningly elegant and amazingly creative! I love the little purse! Thanks so much for sharing! Grace - I love your gift card holder! How clever to use a stamp to create the handles, wow! Thanks for playing in our 'NO, NO, NO Cards' Challenge #22! i love the handbad! what a fabulous inspiration! Grace, this is AMAZING! 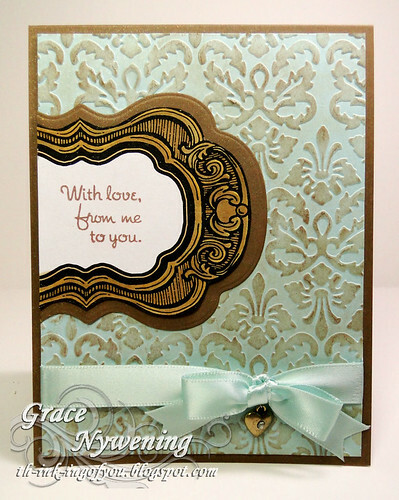 I love the gold, the soothing aqua... the design... I am GIDDY with it all! Hugs to you my friend! WOW!! Gorgeous colour. what a fabulous project. Love it. Oh my gosh Grace, this is exquisite. Such a clever creation. I love it. Absolutely gorgeous!!! Thanks for sharing!! Oh my this is stunning !! I love the purse and card. The colors are so very pretty! What a gorgeous bag. I love the embossing. Thanks for joining us at Polka Doodles. thanks for joining us at tpc...and good luck! Cute purse! You know how some women collect shoes? Well, my mother used to call me the bag lady cause I had so many purses! By the way, when I get nervous, I have hoof in mouth disease and have been nailed so many times by the things I've said without thinking it through before I said it. That's why I was cut to the quick because that's been me. I try to be careful now in what I say, but sometimes things come across that somebody takes wrong and I didn't mean it that way. I just hope that you and others understood that when I commented under your devotion. I felt like God want me to do it as an act of kindness. Well, I didn't mean to write my life's story here. Thank you for leaving me a sweet message on my blog. Blessings and have a great Memorial weekend! Oh my, wow, what an absolutely stunning set. What an outstandingly beautiful set. Excellent choice of colours and so well put together. Thanks for playing at Kaboodle Doodles and good luck. very cute combination! i love that vintage look! Absolutely stunning, gorgeous, and what a keeper! The receiver will be delighted! Just a wonderful projekt, not only the colours but also your elegant style! Beautiful project! Gorgeous colours and love the gold glimmermist! Gorgeous gift set! Thanks for joining us at Polka Doodles and good luck! Oh this is awesome. Thanks for playing at DDH. 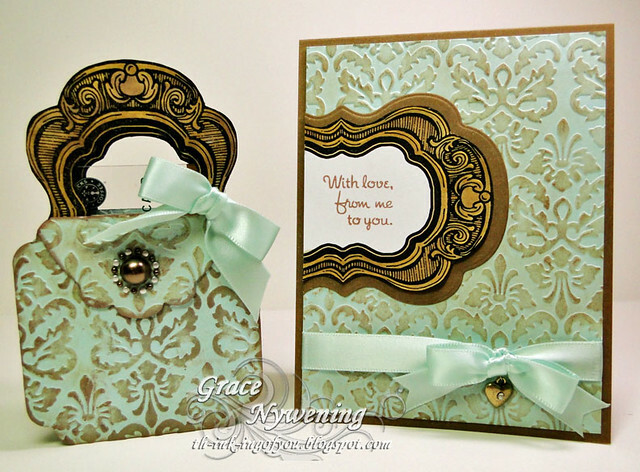 Grace - Congrats on your win of 3 images in Challenge #22 from Pattie's Creations! Make sure you stop in to email Pattie with your image choices. I forgot to mention to grab your 'I Won Badge', it's a pink one.